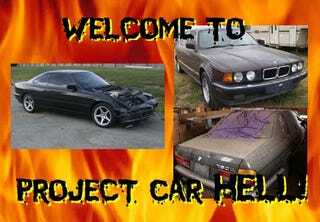 Project Car Hell, V12 BMW Edition: One 850 or Two 750s? With the Studebaker Weasel beating the bratwurst out of the Faun-Kraka in yesterday's poll, we've got the post-apocalyptic Hell Project thing pretty well sewn up for now. But what do you do if you're banking on the machinery of civilization continuing to grind on for the time being? You need to have a ride with style, so that you may drive it over the crushed bodies of your social inferiors on your journey to worship at the shrine of Mammon. You need a big, flashy BMW. In fact, you need a big flashy BMW with twelve cylinders! We've done V12 Jag Hell; now it's time for V12 BMW Hell! When you're talking droolworthy German coupes, the conversation generally gets to the BMW 850 in a hurry. It's got the looks, it's got the handling, and- perhaps most important of all- it's got a freakin' huge V12 under the hood. Why, we even have one in today's QOTD! Yes indeed, we all want one... but who's got that kind of cash? Well, maybe you do! Howzabout this '91 850i, currently sitting on eBay with a bid price well below five grand? Too good to be true? Well, it's got some body damage. Actually, it's been bashed into something unyielding with some authority, meaning you'll be spending staggering sums a few bucks on body parts, not to mention the cost of replacing the airbags. But hey, the seller thinks 8-series airbags are "a dime a dozen," so that comes out to less than a penny per airbag! Oh yeah, it comes with a salvage title. And it may or may not run and drive. Come on, though, turn that frown upside down- all you need to do is get Hector's Discount Body Shop to fix the exterior and then spend an afternoon or two fixing all the mechanical stuff in your driveway! How hard can it be? Some of you, when looking at that 850, may have said to yourselves, "Hey, nice car, but who's got the money for parts?" And you'd have a point. For you, my budget-minded friends, we have this pair of 1991 750iLs, priced to move- or at least limp- at an asking price of a you-gotta-be-shittin'-me $4000. For both cars. Don't groan because you think the 750 is too downscale; after all, didn't Bateman drink his own urine, then grab a stranger and yell "BMW 750iL has the best engine!" in the novel American Psycho? See, that means it's an incredibly desirable object of mainstream consumer lust! Now, some cowardly types are afraid of the engine in these cars; they whine about how one of the two computers that each control half the engine often craps out, making the engine a very heavy six-banger. Then, of course, there's the 47 million engine sensors, which themselves are so ungodly complex that even the Blue Gene would break out in drops of fear-sweat trying to interpret their outputs. But: V12! So, what you get here is a fixer-upper and a parts car, though which is which will be up to you. One of them has a blown head gasket, which, I dunno, might be something of a challenge for your typical backyard mechanic to fix. The other... well, in the seller's own words, it "has some sort of electrical problem, possibly one of the computers. It seems to be stuck on running in economy mode. One of the computers seems to be corroded so that may be the problem." Those gosh darned corroded computers! But hey, a few minutes emery-boarding the chipset pins and you can bet that engine will roar to life!